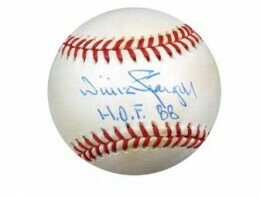 Willie Stargell baseball cards and autographed memorabilia are incredibly popular with Pittsburgh Pirates fans. This is particularly true for those who lived through the team's "We Are Family" days of the late 1970s. 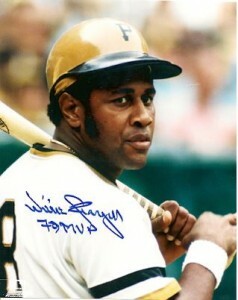 Stargell was the heart and soul of the franchise for much of his 21-year career. His ability to hit for power while still possessing acute situational hitting awareness helped the Pirates earn two National League pennants and two World Series Championships. Willie Stargell's lone rookie card comes from the 1963 Topps Baseball set with the memorable "floating heads" rookie cards. He also has a card that was regionally distributed that same year by I.D.L. Drug Stores. Stargell's first certified autograph card was included in 1992 Front Row. His first autographed card by a major manufacturer is in 1998 Upper Deck Retro Baseball Sign of the Times and is numbered to 600 total copies. Upper Deck was also the first company to bring to collectors a Willie Stargell memorabilia card. He had jersey cards in 1999 Upper Deck Century Legends Baseball. Willie Stargell's autographed memorabilia remains in demand by both Pirates fans and those who followed baseball in the 1970s. A frequent participant at sports collectibles shows and autograph signings before his death in 2001, items related to the Pirates winning the World Series carry the most clout. 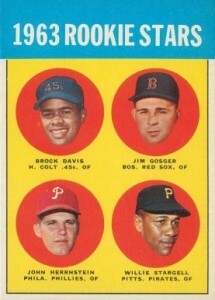 The odd and slightly creepy "floating heads" are easily identifiable as being from the 1963 Topps Baseball set. Stargell shares his rookie card with three other less significant players. WILLIE STARGELL (HOF 88) 1971 TOPPS COINS PSA 8 (NM MT) #123 PIRATES LOW POP! Below you will find an example of what Willie Stargell's authentic signature looks like. This can be used as a first point of reference for determining the legitimacy of autograph memorabilia, but is not a substitute for having your items authenticated by a well-respected professional autograph authentication company. Some of the trusted sources within the sports memorabilia market include the following companies: PSA, JSA, Steiner, Mounted Memories and Tristar. Click on any of the images below to view full size photos. A simple signature written in cursive with a lean to the left and written on an even horizontal plane. The humps of the "W" are rounded with the first line shorter than the second. There are no loops in the "l"'s and the "i"'s are haphazardly dotted, often over the "l"'s, the "e" is hard to discern looking more like and oddly written "z." The letter "S" and "t" are strangely written with a a long and narrowed spaced backwards "c" with a diagonal line running through, the "t" and "r" look identical, with the "a" being very narrow and on an angle with no loop. The "g" has a large loop on the bottom of the letter. This time the "e" looks like a backwards "3" and the "l"s may show portions of a narrow loop.